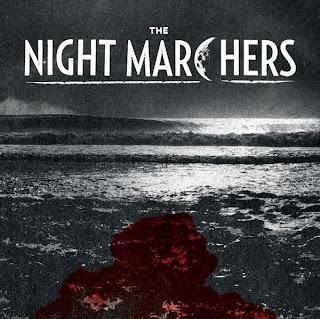 The Night Marchers are the latest project from L.A. based rock n' roll mastermind John Reis and an additional two members of the now defunct Hot Snakes. Sorry kids, Rick Froberg decided to sit this one out. Like all of Reis' past projects, this album is fun unapologetic rock music with no room for filler. While I don't enjoy See You In Magic nearly as much as as Hot Snakes it's still a very solid release in what has been an unremarkable year for music thus far. These guys are currently touring, so make sure you catch them when they roll through your town. hey nice blog, wanted to check out johns new band before purchasing. huge hot snakes fan. noticed on the vagrant records site that u are missing two tracks. "total bloodbath" and "you've got nerve". just thought id let u know and the readers. and yes john is san diego based. Sorry about the L.A./San Diego mix up. At least this got a better reaction than when I called New Zealand "almost Australia." I wasn't aware that the album was incomplete, but I'll try and hunt down the other tracks and repost the link. Anyway, thanks for the feedback guys. Hope my comment about John being 100% SD based didnt come off as harsh. Thanks so much for putting this up, I pre ordered this album but this was a nice surprise find. Great blog too. Oh, anyone else have a problem with the Night Marchers track "We're Goin' Down"? It cuts off around 43 seconds in.....just blank space fiils the rest of the track. Strange. A curse perhaps? nah, wasn't harsh at all. "We're Goin' Down" seems to be working ok for me. could be having some issues like Thee Oh Sees record though. I'll try and get a new version of the album up soon. Something crazy's going on. When I try to get it with Firefox, it opens an empty zip file, with Explorer (with flashget) it stays at 0% and downloads nothing. totally weird. yeah, can't dl from that mediafire link either. and the rapidshare i have found has the last track cut off. would anyone be so kind as to up it again somewhere else? cheers! Download works fine here. Thanks for the post! looks like it has something to do with allowing pop ups. when i saw that last poster say it worked fine i tried one more time and i noticed the little "firefox blocked a pop up" box. i allowed the pop up and everything worked fine! so strange b/c i've never had that happen before! This is a great bank!